As most of us sat down to a feast of turkey and cranberry sauce on Thanksgiving Day this year, an unimaginably large orb of ice and dust went hurtling toward our solar system’s sun. While we toasted and gave thanks, scientists and astronomers aimed their telescopic glasses toward this celestial ball, the Comet Ison. They watched as it approached perihelion—the zenith of its orbit around the sun. Coming within 850,000 miles of the fiery ball of gas, the comet, they predicted, would swing around and blast back out into space. Two days after Thanksgiving, high in the Tushar Mountains of Fishlake National Forest in southern Utah, I walked out into a cold, dark and wooded night. “Where is it?” I asked my boyfriend, my eyes scanning for the comet. 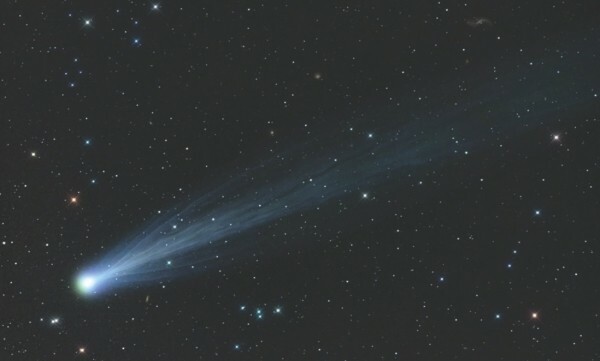 Comet Ison. Every night I looked up, wondering if it had arrived. “I think it’s only visible in the morning sky,” said my boyfriend. Neither of us had heard the news. Ison was no more. Comet Ison was discovered in September 2012—while it was still 585 million miles away from earth—by two Russian amateur astronomers. The comet zoomed along a well-worn path, the Kreutz path, following a trajectory that destined it for a close call with Earth’s sun. Part of a family of “sungrazers” expected to continue arriving in our inner solar system through the coming decade, Ison was born of fragments from a larger comet that broke apart thousands of years ago. Scientists knew that, like its parent and siblings, Ison would be tested by the radiation and gravitational stress of its trip around the sun. If it survived, it would travel within 40 million miles of Earth and be easily visible, perhaps even during the day. Events like Ison’s dramatic and perilous journey around the sun are hard to ignore, and I wonder if it is possible to not be astonished by astronomy. Who doesn’t remember excitedly making a pinhole sun-viewer to watch a solar eclipse? Who doesn’t recall gazing up at Comet Hale-Bopp trailing across the blue daytime sky? Especially here in Utah, where we have some of the darkest skies in the United States, stargazing happens naturally. Since I was young, I have watched the sky. I knew the Big Dipper first. Later, I found Cassiopeia on her starry throne, and the winter constellation of Orion, the hunter. And always, there was the Milky Way splashing its bright mess of white stardust down the middle of the heavens, the far arm of our solar system curving out into space. I never knew how lucky I was to see all these stars—until one night, years ago in Israel, when I stood stargazing from the roof of a friend’s home in a Palestinian village near the border with Lebanon. To the north was the darkness created by an unfriendly border; from the south came the creeping glow of the nearby city of Haifa. The city’s light was just enough to dim the swath of the Milky Way. My friend told me that though he knew of that vast banner of stars, he had never seen it before. It was the first time I realized that some people would never see stars like I could at home. Ison would have been a comet with impeccable timing, growing brighter as the days approached toward Christmas. But the NASA videos of its death don’t lie. In the film, a line re-emerges from behind the sun—the remnants of Ison, a quickly dispersing shadow of dust. Now, I await Ison’s promised siblings, yet to come. Until then, the remaining winter stars are more than an adequate consolation.